we are leading suppliers & exporters of Imatinib Mesylate Tabletsin China, Russia, Hongkong, Bulgaria, Romania, India. Description - The Brand name of this medicine is Glivec . Glivec medicine contains generic Imatinib Mesylate . Imatinib Mesylate are available in form of Tablets. 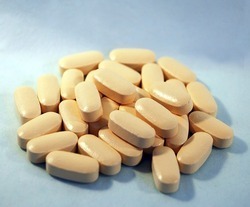 Each Coated Tablet contains 400Mg Imatinib Mesylate. One Pack of Glivec contain 30 Tablets. 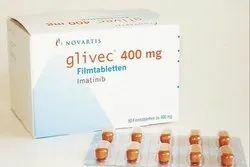 Manufacturer & Marketed company name of Glivec is Novartis Pharma Ltd, India. USED - Glivec is used for treating certain types of leukemia, certain bone marrow diseases, a certain type of skin cancer, and certain intestinal tumors. Warning: Glivec medicine out of the reach and sight of children and away from pets, never share your medicines with others, and use this medication only for the indication prescribed. The information contained herein is not intended to cover all possible uses, directions, precautions, warnings, drug interactions, allergic reactions, or adverse effects. Modern Times Helpline Pharma are the leading suppliers, exporters, dealers of Sorafenib Tosylate Tablets at very cheapest and reasonable price in Delhi-India. We are leading suppliers & exporters of Sorafenib Tosylate Tablet in China, Russia, Hongkong, Bulgaria, Romania, India. We offer wide range of Sorafenib Tosylate Tablet, the cheapest sellers in Delhi, for more info call +91- 9899980831, +91- 9899982831 or mail us at modertimeshelplinepharma@gmail.com. 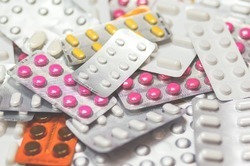 Sorafenib tosylate is approved to treat: Hepatocellular carcinoma (a type of liver cancer) that cannot be removed by surgery. Warning: Sorafenib tosylate is a prescription drug and should be used under proper medical guidance and advice. Modern Times Helpline Pharma are the leading suppliers, exporters, dealers of Imatinib Mesylate Tablets at very cheapest and reasonable price in Delhi-India. We are leading suppliers & exporters of Imatinib Mesylate Tablet in China, Russia, Hongkong, Bulgaria, Romania, India. We offer wide range of Imatinib Mesylate Tablet, the cheapest sellers in Delhi. 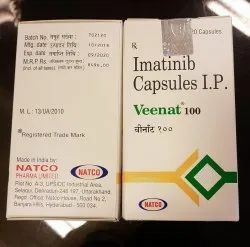 Imatinib mesylate medicine is an effective medication for curing leukemia (chronic myeloid leukemia or cml) and gastrointestinal stromal tumors (gists - a type of tumor that grows in the walls of the digestive passages and may spread to other parts of the body. Warning: Imatinib mesylate is a prescription drug and should be used under proper medical guidance and advice. The information provided here is for general educational purposes only and does not constitute medical or pharmaceutical advice which should be sought from qualified medical and pharmaceutical advisers. Imatinib Mesylate Suppliers India, Buy online Imatinib Mesylate dealers India, Online Imatinib Mesylate Exporters India, Imatinib Mesylate Suppliers China, Buy online Imatinib Mesylate dealers china, Online Imatinib Mesylate Exporters China, Imatinib Mesylate Suppliers Russia, Buy online Imatinib Mesylate dealers Russia, Online Imatinib Mesylate Exporters Russia, Imatinib Mesylate Suppliers Delhi, Buy online Imatinib Mesylate dealers Delhi, Online Imatinib Mesylate Exporters Delhi. Description - The Brand name of this medicine is Veenat . 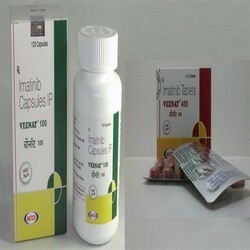 Veenat medicine contains generic Imatinib Mesylate. Imatinib Mesylate are available in form of Tablets. Each Film Coated Tablet contains 400Mg Imatinib Mesylate. The colour of the Veenat Tablet is Yellow Oxide Of Iron,Red oxide of iron & Titanium Dioxide. One Pack of Veenat contains 30 Tablets. Manufacturer & Marketed company name of Veenat is Natco Pharma Ltd, India. USED - Veenat 400 Mg Tablet is used to treat and prevent the growth of certain types of cancers of the blood cells, stomach, intestine, bone marrow, and skin. Warning: Veenat medicine out of the reach and sight of children and away from pets, never share your medicines with others, and use this medication only for the indication prescribed. The information contained herein is not intended to cover all possible uses, directions, precautions, warnings, drug interactions, allergic reactions, or adverse effects. 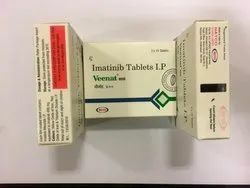 Imatinib Mesylate, sold under the brand names Veenat among others, is a chemotherapy medication used to treat cancer. Specifically, it is used for chronic myelogenous leukemia (CML) and acute lymphocytic leukemia (ALL) that is Philadelphia chromosome-positive (Ph+) and certain types of gastrointestinal stromal tumors (GIST), systemic mastocytosis, and myelodysplastic syndrome. Precaution: This medicine should not be used until prescribed by your doctor. It is also not prescribed by the doctor if you have ever suffered with low blood platelets level, swelling, low white blood cells, bone marrow, pulmonary fibrosis, etc. Warning: Imatinib is a prescribed medicine and must be used under the strict guidance of the medical practitioner. KIND ATTENTION: Imatinib Mesylate is a prescription drug and should be used under proper medical guidance and advice. Do not share the medicine with others, since they may be suffering from a problem that is not effectively treated by this drug. Keep medicine in dry place. Guidance and Advice: Veenat medicine is a prescription drug and should be used under proper medical guidance and advice. Modern Times Helpline Pharma are the leading suppliers, exporters, dealers of Imatinib Tablets 100Mg at very cheapest and reasonable price in Delhi-India. We are leading suppliers & exporters of ImatinibTablets 30Mg in China, Russia, Hongkong, Bulgaria, Romania, India. 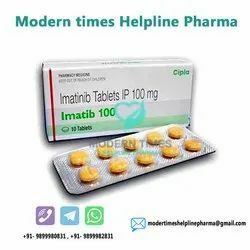 We offer wide range of Imatinib Tablets 30Mg, the cheapest sellers in Delhi, for more info call +91- 9899980831, +91- 9899982831 or mail us at modertimeshelplinepharma@gmail.com. WARNING: - Imatib is a prescription drug and should be used under proper medical guidance and advice. Description - The Brand name of this medicine is Imatib . Imatib medicine contains generic Imatinib Mesylate. Imatinib Mesylate are available in form of Tablets. Each Film Coated Tablet contains 400Mg / 100Mg Imatinib Mesylate. One Pack of Imatib 400 contains 10 Tablets and One Pack of Imatib 100 contains 10 x 10 Tablets. Manufacturer & Marketed company name of Imatib is Cipla Pharma Ltd, India. USED - Imatib Tablet is used in the treatment of blood cancer (chronic myeloid leukaemia) and stomach cancer. Warning: Imatib medicine out of the reach and sight of children and away from pets, never share your medicines with others, and use this medication only for the indication prescribed. The information contained herein is not intended to cover all possible uses, directions, precautions, warnings, drug interactions, allergic reactions, or adverse effects. Description - The Brand name of this medicine is Veenat . Veenat medicine contains generic Imatinib Mesylate. Imatinib Mesylate are available in form of Tablets. Each Film Coated Tablet contains 100Mg Imatinib Mesylate. The colour of the Veenat Tablet is Yellow Oxide Of Iron,Red oxide of iron & Titanium Dioxide. One Pack of Veenat contains 30 Tablets. Manufacturer & Marketed company name of Veenat is Natco Pharma Ltd, India. USED - Veenat 100 Mg Tablet is used to treat and prevent the growth of certain types of cancers of the blood cells, stomach, intestine, bone marrow, and skin. Description - The Brand name of this medicine is Imatinib Mesylate . Imatinib Mesylate are available in form of Tablets. Each Film Coated Tablet contains 400Mg / 100Mg Imatinib Mesylate. One Pack of Imatinib Mesylate contains 30 Tablets. Manufacturer & Marketed company name of Imatinib Mesylate is Natco Pharma Ltd, India. 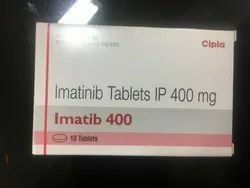 USED - Imatinib Mesylate 400 Mg / 100 Mg Tablet is used to treat and prevent the growth of certain types of cancers of the blood cells, stomach, intestine, bone marrow, and skin. Warning: Imatinib Mesylate medicine out of the reach and sight of children and away from pets, never share your medicines with others, and use this medication only for the indication prescribed. The information contained herein is not intended to cover all possible uses, directions, precautions, warnings, drug interactions, allergic reactions, or adverse effects.